In general, dont panic. Driving in America is in my experience simpler and less stressful than in the UK. The drivers seem less hurried and more courteous. There are of course many differences and this page outlines many of those. Scroll down to read all about them. Of course the most obvious difference between the UK and the USA is that in America they drive on the right hand side of the road. This is much easier than you would imagine, especially when you are driving a left hand driver position car. Once driving on the road I've never got confused, but coming out onto a road from a petrol station or a car park, it is easy to set off towards the wrong side of the road. Get in the habit of pausing before you pull out and making sure you are oriented properly. 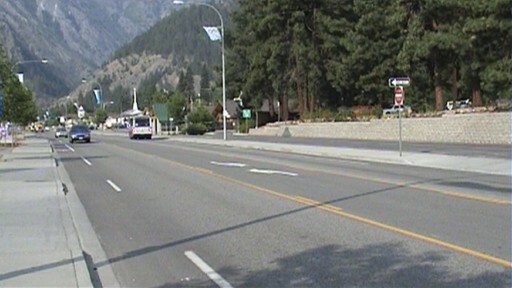 In many towns in the USA, the roads will have five lanes. This is two lanes in each direction and the centre one for turning left. 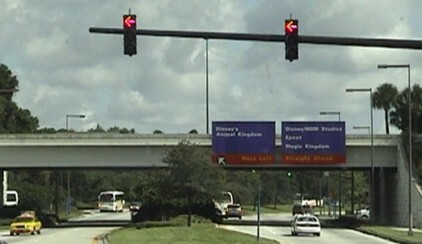 Occasionally as in the picture to the right, there can be three lanes, one each way and the centre one for turning left. This is a great system once you've got the hang of it, but be careful, the lane can be used by traffic from either direction so keep your eyes open. If you are driving along a road with a central lane and wish to turn left, look ahead to make sure another vehicle is not about to use the lane. 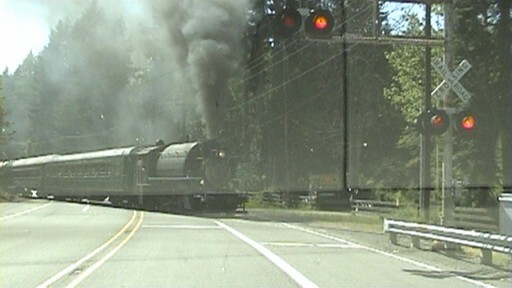 Then indicating left pull completely into the middle lane and stop just before your turn. Wait for a gap in the oncoming traffic and complete your turn off the road. If you are wanting to turn left onto a five lane road this is where this system is excellent. Wait for a gap in the traffic coming from your left and then after ensuring nobody else is using the centre lane pull over completely into the centre lane and stop. You then wait for a gap in the traffic on your right coming from behind you, accelerate down the centre lane, and pull into the two lanes going in the direction you want. 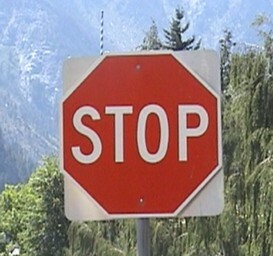 You have to come to a complete stop at a stop sign even if the roads are deserted. Some junctions even have stop signs on every road entering the junction to force traffic to stop before moving on. Ignore this at your peril. I had the misfortune to be navigating my way on the outskirts of a tiny town in Colorado when with great whoop of the siren and flashing of lights a police car pulled me over. The armed Colorado Highway Patrol Officer told me to get out of the car and show him my documents - ID (passeport in my case) drivers licence and car hire documents. Panic ensued as I fumbled through the bags before finding them. Top tip - keep all your documents handy when you are driving, I do now !. He explained that he had seen me approach a T junction with a stop sign and fail to stop (I had virtually but not quite stopped and then pulled away because there was not a car anywhere to be seen). I appologised profusely and he said to be more careful in future and issued me with a courtesy ticket. Now a prized souvenir. My Father in Law was caught in similar fashion in Boulder Nevada so its plainly enforced all over. Be warned, when you see a stop sign, STOP! In most places in America you can turn right at traffic lights when they are red as long as the road is clear to do so. Apparently this is not the case in New York. On some juctions where it is considered dangerous to turn right on a red light (poor visibility, very busy road) there will be a sign that says 'No turn on red'. 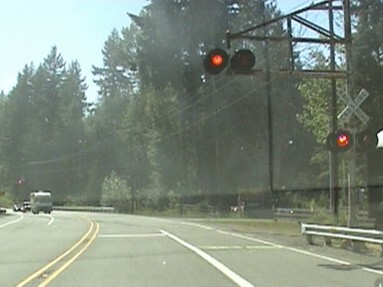 Many major junctions will have traffic lights suspended from wires diagonally across the junction or cantilevered out on beams as in the pictures below. The light for your lane will be directly ahead of your lane. Its important to watch only your light as the ones at the side of you may go to green before yours does e.g. to filter left or right. With all the space they have in the USA, junctions are normally well set out and spacious. If you are driving along a road with two lanes each way, it will often spread to four lanes each way at a junction. The left hand lane for turning left. The right hand lane for turning right. The centre two lanes for going straight on. Watch the lights for your own lane carefully at such junctions (see traffic lights above). On Interstates when you are looking for a particular junction watch for the signs very carefully. You do not have a sign some way before the junction followed by the count down markers as we do in the UK. You will get a sign some way back telling you the junction is coming and the next sign you see will be at the junction itself. Get in your lane early. Again on interstates, be careful about which lane you are in. The right or the left hand lane can suddenly become a slip road. If you are not alert you can find yourself leaving the road you want to be on. Finally, when turning onto an interstate you are at risk of letting your UK driving intincts take over and turning onto an 'off ramp (slip road). These are very well marked and invariably have a do not enter sign posted as in this picture. They are further supplemented by another sign further up the slip road saying 'Wrong Way'. Watch for these two signs and take heed. You can be overtaken by cars on either side of you. Be prepared for this as the first couple of times it happens can be quite disorienting. The temptation is to hug the right hand lane which most times is a good strategy. The problem is that very often the right hand lane becomes a right turn only lane at junctions so be careful and watch the road markings. It is very clear when the lane is right turn only as long as you are not in heavy traffic which can obscure the markings on the road. If you get caught in a right turn lane you do not want to be in, dont panic. Turn right and find some where to turn back round. one of these is coming !!!! I'll tell you one more that really took me by surprise. We are so used to the "outside" lane being the fast lane (need to stop that in the us!) that when I saw a service area turn off in what naturally felt like the fast lane - I could not believe it!. A service station in the middle of the central reservation! Tip, when driving from the Grand Canyon to Page and then onto Kanab, make sure that you you have PLENTY of fuel, from Page to Kanab there are NO petrol stations and it is about 100 miles, so be careful, we nearly weren't! The area is virtually uninhabited! And we passed saw 2 vehicles in 3 hrs. Scary! RE: Driving in USA/Driving on Interstate Highways, Right lane ends etc. On Interstate Highways and many other limited access highways there is a warning sign in YELLOW either to the right if it refers to the right lane, or suspended above the lane that is being advised that the lane is an EXIT ONLY, or that the lane ends and it often gives a distance (e.g. 1/4 mile, 1/2 mile, 1 mile, etc). Gas Stations. This one caught us out. The gas stations all appear to take PIN number debit or credit cards. Some don't even have an attendant. You put your card in to the dispensing pump, prior to service, punch in your number and fill your tank. If you don't have a PIN card you may need to find a service station that will let you pay cash. Again you will have to lodge cash with the attendant prior to fuel provision. Thankfully, they do give you change! City road signs. You will need a good city map! My impression was that you very rarely got advance warning of any road names. If, like us, you are blessed with failing eyesight, you are nearly upon a junction before you can read the overhead road name sign (normally suspended from the traffic lights). If you need to turn right or left on that road, and you find you are in the middle of five lanes of traffic, tough! I found both LA and San Francisco to be bad but by the time I got to Phoenix I had it all worked out. Another difference is traffic flow control on the entry slip roads (the equivalent to our accelaration lanes on a the motorway) to some main Interstates and freeways. If you are joining the Santa Monica Freeway in LA, your entry onto the freeway is controlled by a small traffic light signal positioned actually on the access slip road. They are hard to spot, normally positioned on the verge as opposed to the standard USA overhead system, and are designed to allow 1 car per lane to join the freeway at specifically timed intervals. If my memory serves me right, this system is also apparent on a few of the other major freeway entry routes too. Watch out for them as our UK driving conditions us to assume that once we are on the accelaration route we don't have to stop. I agree with "Di's" comment about the street signs. They are usually so small it is hard to plan your turns. 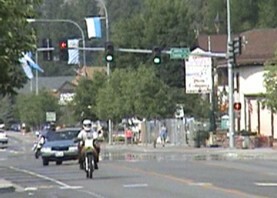 I was in Yakima (Washington State) the other day and was driving down the street looking for "1st Avenue." By the time I could read the sign I was already at the intersection and couldn't get into the correct lane for my turn. So I had to drive straight ahead and then go around the block to get onto 1st Avenue. I've seen the same problem in numerous other towns. When driving in LA the outside lane of the freeway is for cars carrying at least two people. Everywhere that I have driven speeding fines are DOUBLED in roadworks. This is a tip about driving in the U.S. I'm actually an American, I live in Los Angeles, and a British friend was traveling through the southwest recently. It was her first trip out on her own and she was pulled over by the highway patrol for speeding. She told me she was so scared she could barely talk; the officer let her go with a warning because he thought she might cry. Turn off the car, turn off the radio, open your window, keep your seatbelt on, and don't fumble around for your documents. Keep your hands on the steering wheel until they ask you for your documents. When they ask you for documents, tell them where you have them (the glovebox, your purse, etc.) and ask if you may reach for them. Think about it from the officer's point of view. He doesn't know if you just robbed a bank and are reaching for a pistol. If you were speeding, missed a stop sign, etc., say you're sorry and you're unused to driving here. If you're a foreigner, most often you'll get nothing but a warning, or even directions to where you're going. The suggestions above might make it sound like American cops are trigger happy nuts who need to be put at ease. In fact, 99.9% of them are nice, warm people who just want to make it home to their families. Doing the things suggested just makes their job easier and they'll appreciate that. By the way, cops from the smaller towns or more rural areas might even bend your ear a little, proudly pointing out the local points of interest. Big city cops are just as polite, but maybe have less time on their hands. And remember, real American cops are NOTHING like movie cops. 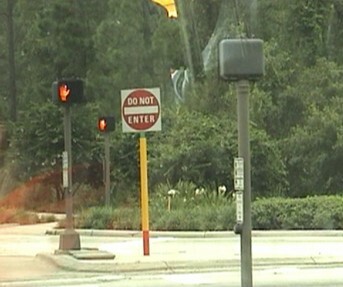 This is a tip about Road signs when driving in the U.S. I live in the U.S. When I drove in the U.K., I kept looking for north/south/east/west indicators on the motorways and A-roads, because that is what I am used to at home. Instead, I had to get in the habit of looking for a series of town names. Your readers, facing the opposite situation, might like to know that major U.S. roads carry indicators for north/south/east/west, and that Americans learn to navigate by using these directions. For example, if I were driving from my home in Atlanta to Chicago, I would follow I-75 north, to I-24 west, to I-65 north, to I-90 west. I might not even know the names of cities on the way, as long as I had taken note of the highway number and direction. Even on routes that circle cities, like London�s M25, will be so labeled: Atlanta�s I-285 goes (traveling clockwise) from I-285 north, to I-285 east, to I-285 south, to I-285 west, and back to the start at I-285 north. Using interstates, before each junction there are usually signposts for eating places just off the Interstate. As services are infrequent in some states (rest areas do not serve hot food) it is easy to follow the signposts to these restuarants. Then eat and return to the interstate.